What’s on your open agenda? Today Frontiers welcomes David Porter, Executive Director of BCcampus which is a publicly funded organization that uses information technology to connect the expertise, programs, and resources of all B.C. post-secondary institutions under a collaborative service delivery framework. There have been splendid examples of open thinking and open practice throughout 2011 and into 2012, quite a number of them highlighted by my colleague Paul Stacey in his Year of Open blog post in December 2011. It hasn’t stopped, and it won’t stop. Since 2003, BCcampus, has been a conduit for government funding aimed at supporting the development of open course materials and resources. To date, our provincial government has put $9.5M into our online program development fund (OPDF) to support practices among institutions that promote collaborative approaches to the development and delivery of open educational programs. For government, the benefit of OPDF is that it leverages the impact of its educational investment. For us, it’s a demonstration of the ethos of openness. Our institutions and instructors have all benefited from the financial support and we as an organization have been able to engage with faculty and instructors on the real benefits of openness. Now, the time has come for us to focus on policy as another component of the open education agenda. 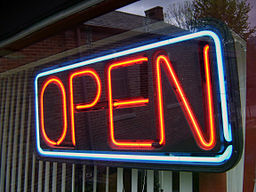 On March 26, 2012 Cable Green of Creative Commons announced the creation of an OER policy registry. The registry is designed as place to share policies and resources that support the work of open advocates globally. For us the CC Policy Registry is a welcome next step. We’ve been lobbying our own government throughout 2011, pointing to policy initiatives in neighboring jurisdictions such as Washington State, and helping our senior administrators make sense of emerging examples of open policy and legislation. Because we are committed to move ahead on the policy front we decided to expand and communicate our own approach to open practices—practices that are under our control and that we believe will allow us to demonstrate actionable policies and strategies that others may also choose to adopt. “BCcampus is committed to being open in everything we do. This has implications for how we operate on a daily basis. Our public meetings and events are streamed live online whenever possible. We will take photos and notes of our face-to-face events, and screen shots from our online events, and post them on our web sites and through our social media accounts on Twitter and other sites. We encourage speakers and participants to do the same with slides, photos, videos, crowd-sourced notes and discussions. We will post archival video of keynote addresses, presentations, panels and discussion sessions on our web properties for anyone to view and comment on. Speakers, facilitators, and attendees of all events, online and face-to-face, will be made aware at time of registration that contributions of the community will be shared in these ways. We are committed to open data and open information, which is about proactively releasing information to our stakeholders on an ongoing basis. We will distribute all BCcampus reports, web content, and other media resources using the Creative Commons CC-BY license. We are always seeking ways to give the post-secondary system a stronger say in BCcampus strategic planning and priorities, and expanding engagement through online technologies. We will enable moderated commenting on all our web pages where appropriate, and make use of opt-in mailing lists to disseminate information and solicit feedback. BCcampus has a solid reputation for supporting the development of open resources in the context for professional development and academic growth. Resources developed as a result of BC Online Program Development Fund (OPDF) are mandated to use an open license. Our professional development activities through the Educational Technology Users Group and SCoPE have a long history of encouraging open sharing, reuse and remixing of knowledge and resources. In the interests of remaining transparent in our business processes, BCcampus will refrain whenever feasible from signing non-disclosure and confidentiality agreements with vendors and partners. We are committed to offering open data in useful formats to enable our stakeholders to leverage it in innovative and value-added ways. BCcampus supports freedom of choice in technology and where possible source files will also be made available in open and free file formats. While we all wait for governing bodies to get their heads into policies that will help enable more open practices on our campuses and across our systems, there are likely things you can do now to move the open agenda ahead, whether you’re an institution, a statewide consortium, or an academic department. Work with your colleagues to determine which elements of your collective work can be made open and accessible, using open file formats and appropriate licenses. Adapt and adopt good policies that others have made open for you to use. Contribute your open policies and practices to the Creative Commons Policy Registry. Tell us about it: contact us via email, twitter or through our web site and let us know how your open agenda is progressing.